I Am Staying In K-Town & I’m Now On The 4th Comp! Kearns. We got transfer calls and I will be staying here for another transfer (my 6th here), and I also have gone through my 3rd companion and am now starting on my 4th. My new companion’s name is Elder Mayo; he has been out about 17 months and he is from Rochester/Palmyra, NY. He seems like he is a pretty good guy, and is all about getting things done which is good and what I work a whole lot better with too. We have a lot of potentials that we are working with right now, and we have a couple more investigators that we are planning on picking up this week to put on for this month. A lot of interesting things have happened this week, but the coolest one of them all was that I have been able to start learning things in Samoan (as you can see above). 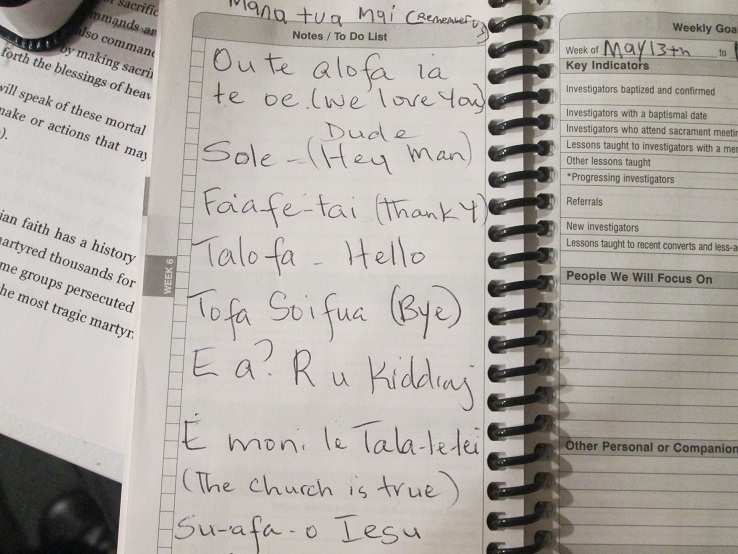 I figure that if I will be serving in a Samoan Ward for 9 months, I might as well start learning some Samoan while I get the chance to. Not too much else has been going on here, but it seems like things are starting to pick up a whole lot too which is good. I hope that all of you continue to do well back home! Aua-Le-Popole Fia Fia (Don’t Worry, Be Happy in Samoan)! Take Care Everyone! I love and miss each of y’all!